In the late eighteenth and early nineteenth century silkwork embroideries were particularly popular. As well as classical subjects, mourning pieces and topographical embroideries were also produced. After completing their childhood samplers young women from the leisured or genteel classes would progress to embroidering one or more of the fashionable silk pictures. Patterns could be purchased from shops selling embroidery and other craft materials. Often inspired or copied from popular prints of the period, they were bought ready drawn onto a silk ground with such details as faces, hands and sky painted in with water colour ready for embroidering. Fame Strewing Flowers Over Shakespeare's Tomb. A particularly well executed version of this popular subject is taken from an engraving by the American artist Angelica Kauffman. 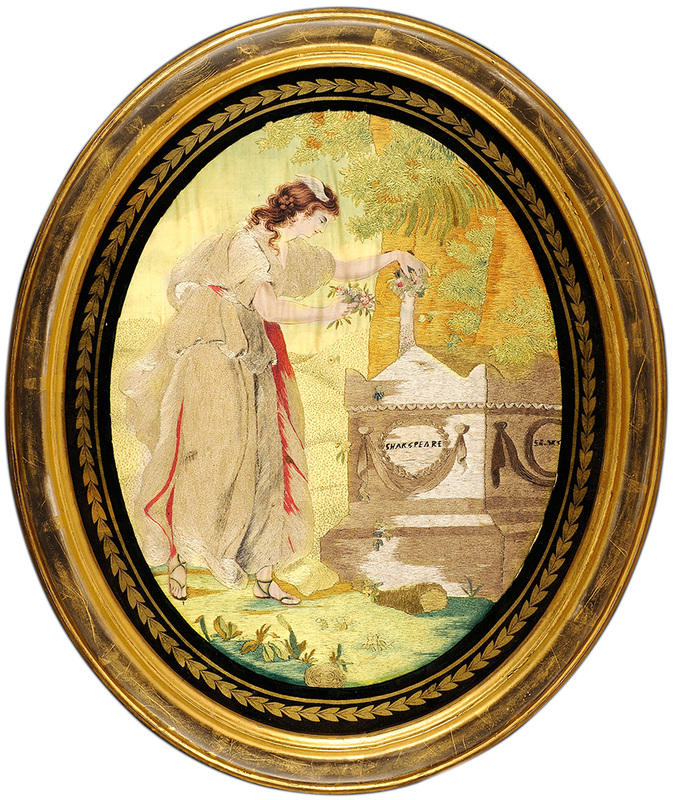 Worked on a silk ground with well shaded coloured silks and contained in a gilt wood frame with a verre eglomise mount..
Mourning Embroidery Early 19th Century. 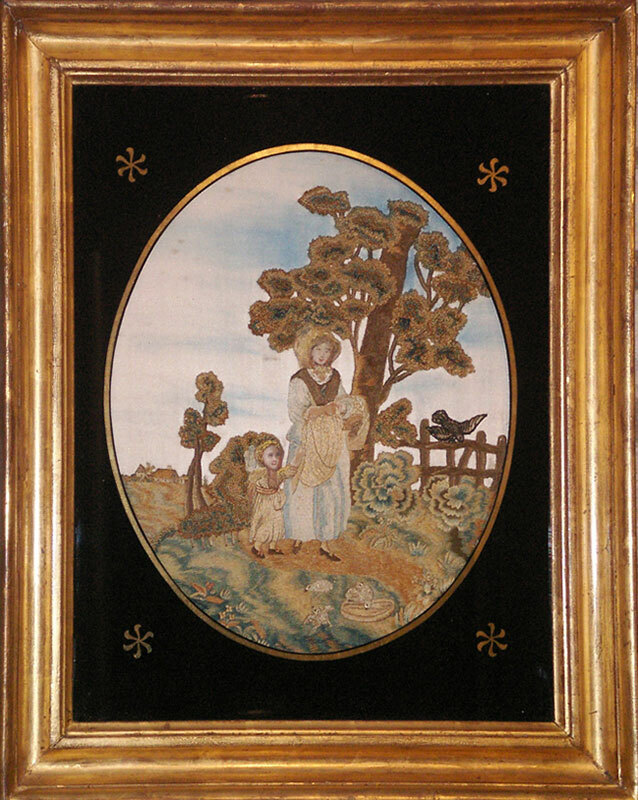 Mourning embroideries were popular in America during the early 19th Century. 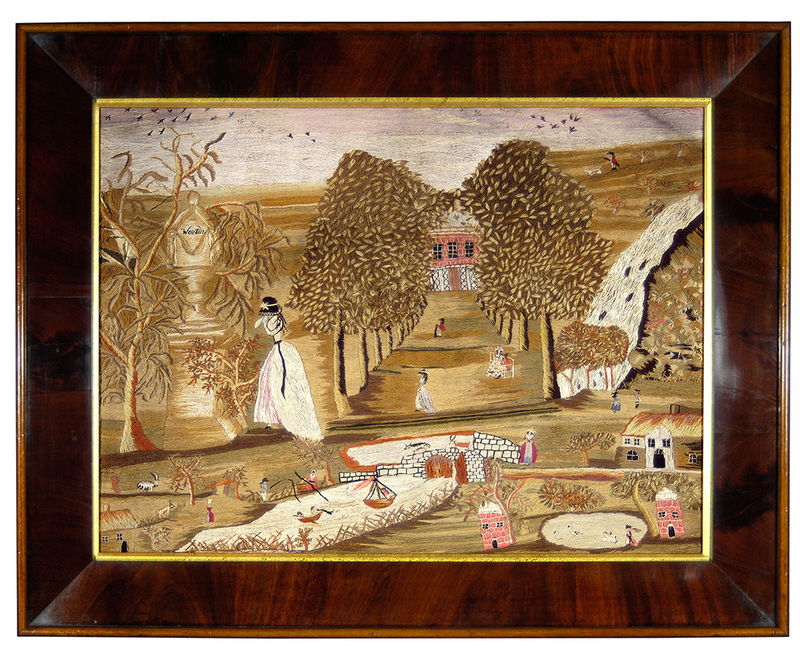 This unusual rendition has a folk art appeal and is worked in fine wool and silk threads carefully shaded. The main character is a fashionably dressed young woman with a hat pulled down over her face standing beside a classical urn- topped memorial. The whole set in a country landscape with a formal avenue of trees leading to a large house. 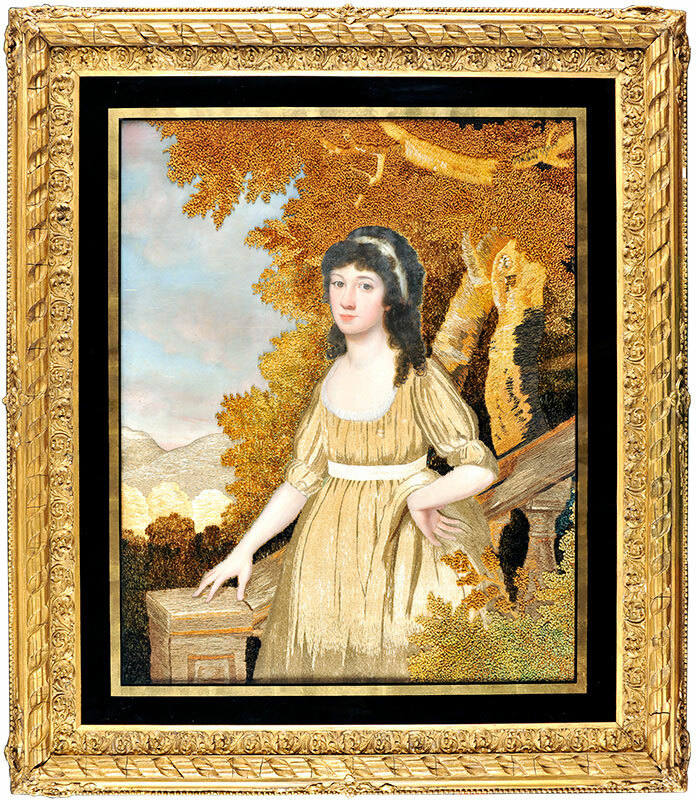 Contained in a handsome period broad mahogany frame. The back of one stretcher bearing a hand written inscription 'Embroidered by Elizabeth Neal in the year 1788. Transferred by her daughter Sarah Armstrong 1852' Many English patterns were sent over to America to be worked by school girls at fashionable academies specialising in embroidery. 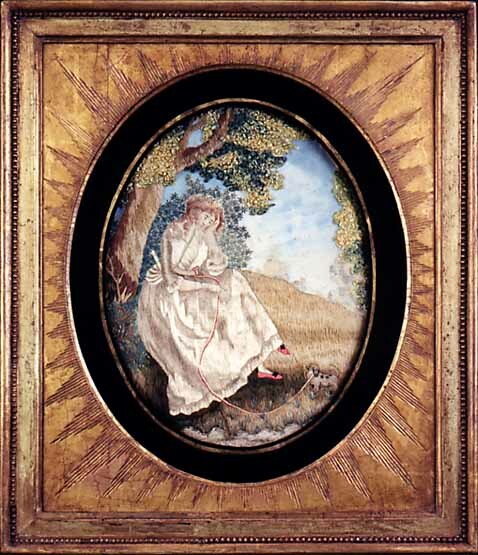 Whilst the use of water colour with silk was a popular medium and commonly practised, the use of oils in combination with needlework is most unusual. This large portrait of a fashionably dressed young woman was probably commissioned and the work of a professional artist. It is probable that having completed the commission in oils the sitter herself finished the work using rich floss silks. Contained in the original gilt wood frame. Framed size: 35 x 31 ins. 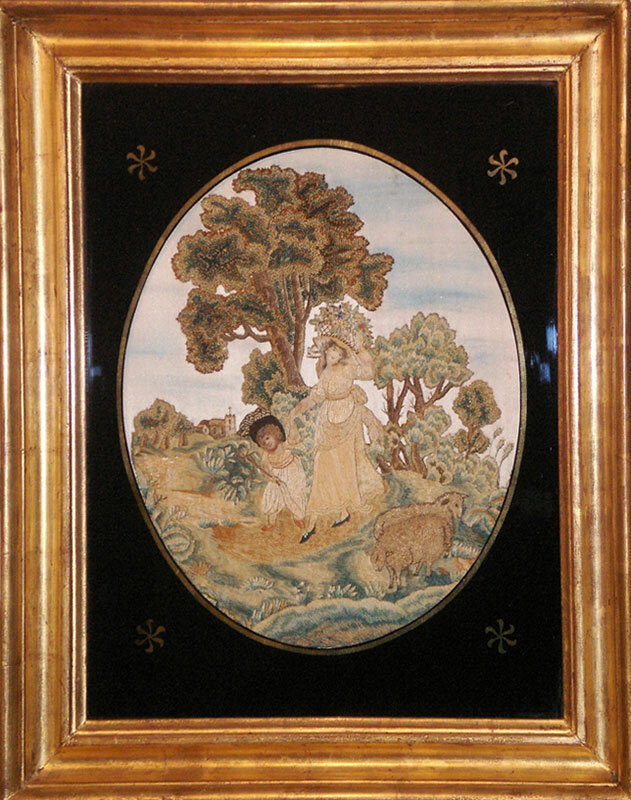 This subject was popular with embroideries both in England and America. Silk on silk with painted detail contained in the original star frame. Framed size: 43 x 51 cm.